Black Friday lia sophia Sale! I'm having a special online-only black friday sale on my website- http://www.liasophia.com/heatherstclair . Utilize our December customer save plan and buy any two items at regular price and choose up to FOUR at 50% off!! You can choose your most expensive items to be the half-off ones! In addition, at my private sale, you can take an additional 10% off your entire order from 5 am-midnight tomorrow! Want to host a party? Email me a date and I'll take 15% off your order!! Like that idea, but don't live near me? Think about having an "online catalog" party! Just visit my website and put your order under the hostess name, "Heather St. Clair". Hope to "see" you there! Finish your holiday shopping from the comfort of your own home! Will our government listen to this? This Pumpkin Raisin Cake sounds delicious and the picture on the page looks so moist- if you can really tell that from a picture lol. Preheat the oven to 350 degrees F. Lightly grease a medium Bundt® cake pan. Beat until a smooth, fluffy batter forms. Note: As mentioned above, if you are using real eggs, you may need less liquid than I did- so start with 1/4 cup non-dairy milk and see how it goes. Add a tablespoon more at a time to achieve a smooth cake batter. Scoop the batter into the Bundt® cake pan and spread evenly. Bake in the center of a preheated oven for 45 to 50 minutes until the cake is firm when lightly touched. Double check with a cake tester, if you like. Note: Baking time may vary for you- I bake at over 7,000 feet. Cool on a wire rack before inverting the cake onto a serving plate. Cool before slicing- this is a moist and tender cake. I wrapped and froze ten slices for future snacking. Cinnamon raisin bread sounds delicious! I need to make a bread substitute for Brian but he's been INCREDIBLY, even more so than normal, picky lately so maybe a sweet bread would be perfect for him! Mix all the wet ingredients in an electric mixer. In a separate bowl mix dry ingredients. Slowly add dry ingredients to wet ingredients until the batter is completely mixed. Beat on high for about 2 minutes. Add raisins and stir. Pour batter into two small loaf pans. Bake at 375 degrees Fahrenheit for 10 minutes and then reduce heat to 350 degrees Fahrenheit for 45 additional minutes or until a toothpick inserted into the loaf comes out clean. Let the loaf cool completely before slicing. This recipe slices beautifully in an electric slicer. I LOVE apple crisp!! We made this super-easy recipe after we went to the apple orchard this fall- I ate it all in like two days lol. Yeah, just me. Because as I've mentioned a few times both of my children are extremely picky and Apple Crisp honestly doesn't LOOK appetizing but, oh, is it! Peel, core and slice the apples into a bowl, and sprinkle with lemon juice. Blend the rest of the ingredients in a bowl. Spread the apples in a bake pan, and cover with the blended ingredients. Bake for about 30 minutes or until golden. This Marbled Pumpkin Cheesecake looks delicious! I think this is THE one recipe I KNOW I'm gonna attempt! I'm hoping to wow Josh's family with how yummy a baked GF/CF dessert can be and I'm thinking this may do it! Crust: Grease 10 in. spring form pan. Preheat oven to 325. Combine cookie crumbs and melted butter in food processor. Press into bottom only of spring form pan. Top with ½ pkg. chocolate chips. Set aside. Cheescake filling: Melt remaining chocolate chips until smooth. Set aside. In large bowl, beat Tofutti cream cheese, sugar, brown sugar until smooth. Beat in pumpkin. Beat in eggs and coconut milk until blended. Mix in by hand cornstarch, cinnamon, nutmeg. Then beat with mixer until blended. Stir 1 cup of pumpkin/Tofutti mixture into melted GFCF chocolate chips. Mix well, set aside. Pour remaining pumpkin mixture into spring form pan on top of chocolate chips. Spoon chocolate mixture on top of cheesecake mixture in small mounds. Swirl with a knife. Place spring form pan on a baking sheet. Bake at 325 for 60 minutes or until filling is set (center may still jiggle a little). Turn off oven, but let cheesecake stand in oven with door open a crack for about an hour. Cool at room temperature for another hour then refrigerate. 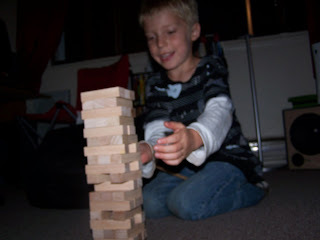 I know as Brian's parent I believe I block out thinking about what is going to happen when he is an adult with autism. I don't think about it so maybe it won't happen. Honestly, it never crossed my mind perhaps the whole first year of his diagnosis. I remember the day that I first thought about it. I was helping my Dad with his small part-time landscaping business and we were at a beautiful location- a house right on a cliff by the ocean. We were taking a break and just staring out to the horizon when Brian came up as our subject. My Dad asked me if I had started any accounts for Brian for when he was an adult and if I had thought about the choices he would have for living accomadations as an adult. I remember tears instantly formed in my eyes. I hadn't thought about it. At that point I wouldn't allow myself to believe that I couldn't get him out of his world with the biomedical approaches and intensive ABA services I had chosen for him. Sometimes I still don't allow myself that but I do realize that no matter how much I hope, pray, and work for him to lose the diagnosis it just might not happen. And reality will always be there. What services are out there for adults with autism? Not much, right now, unfortunately. But we're going to need to change that as these 1 in 150 kids become adults- there is going to be an overwhelming need for change! Age of Autism posted a link to this story, All Grown Up, this morning- please take the time to read it! I was lying in bed, trying to will myself to get up, when I heard Corbin sleepily emerge from his room and trod his way into the bathroom. Of course, immediately following, I heard Brian's door open. The boys never get up without the other! I heard Corbin urinating and then heard him say, "Haha, Brian what are you doing? Do you hvae to pee?" Brian must've been pulling his pjs off. Brian replied, "Yeah." Corbin said, "Okay Brian, come on over." I heard Brian tinkling and then Corbin said, "Do you need to pee more, Brian?" and Brian replied, "All done". Such a little thing made me smile so wide while I laid there in bed because I believe that is the first time I've heard the boys have an actual conversation together! Age of Autism has been running a lot of articles the past few days about the staggering rates of autism being found in Somali-children in Minnesota. The guess right now is 1 in 28 children. The parents say autism was very rare back in their home country yet all of a sudden all of their children are succumbing to this nightmare, that we all know so personally. The parents are definitely pointing their fingers toward vaccines as their children have been subjected to a lot more immunizations than ever before and some have been doubled up. And believe it or not, the CDC has not even visited, commented, or acknowledged this epidemic. I want to Sue People. 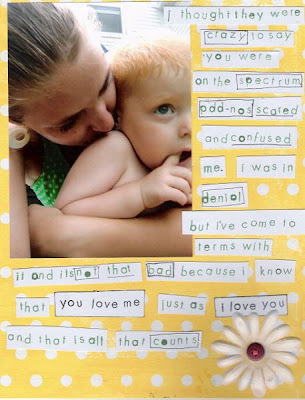 I made this scrapbook page about a month or two after Brian's initial diagnosis- at the time it was PDD-NOS, I think our first evaluator just wanted to ease us into the world- as later on we realized he was definitely "full-blown" autistic- as the next two evaluations confirmed. I love this layout though- and sometimes when I am just feeling too stressed with issues surrounding us I like to read this. And remember that he does love me even if he can't always show it. I love him so much- and always will, no matter how little or how much he progresses. That is all that matters. I'm sorry it's taken me sooooo long to update- I've had a few people write asking how it went, so I apologize! So we left our house a little after five in the morning, I waited and got Brian out of bed just seconds before leaving hoping he'd sleep the hour and a half ride to the hospital but he was wide awake and just in the best mood! I thought the morning would be awful as he wasn't allowed to eat breakfast and of course the night before he fell asleep RIGHT before dinner and there was NO WAY to wake him up. He was OUT. So no breakfast and no dinner. But like I said he was just smiling from ear to ear- the whole ride- like he thought we were going on a private adventure- just Mommy & Brian. When we arrived in the hospital he walked all the way in by himself (a big accomplishment because he thinks he needs to be carried everywhere). We went in, he waited so well while we registered, followed a volunteer who showed us to the pediatric sedation wing while thoroughly looking around everywhere, soaking in his surroundings- another BIG thing. We opened the door to the wing, he walked in ahead of me, found the nurse, looked at her and said "Hi" before she said anything to him. He seemed so big to me and wise beyond his years. Later when the nurse was putting on the numbing cream he was becoming quite antsy and I made a comment about "one of his many autistic traits" and the nurse looked at me and said "He's autistic? I would've never known the way he said hi and made eye contact with me!" It felt so good to hear her say that. A few minutes later I think she got a clear picture of his autism. 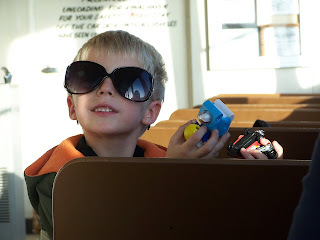 He was soon stimming out on a train in the waiting room- after just barely evading a tantrum because he couldn't find the engine to the cars and of course that was not okay. We found it- phew. He did okay with the weight & height- a little cranky about doing it but not too bad compared to other doctors' visits we've been on. They did do the IV while he was awake. That was hard. I hold to hold him on my lap and it took three other adults as well to help do the IV. He cried but I think the tears were more from just the discomfort of being held down and the tape around the IV than the actually poking. They got it in on the first poke thankfully. Afterwards he kept pointing to it and saying "ow" or "boo boo". A little sad but oh so cute when he uses his words appropriately! The unit was SO great there- I was able to HOLD Brian while he recieved his IV meds to be put to sleep, he fell asleep in my arms. We were in the same room for the whole routine and I was allowed to stay in the room for the entire procedure. I did leave at one point to grab a bite to eat and buy Brian an Elmo balloon from the gift shop. The procedure went well- his hearing is fine. I suspected it would be but it is nice to just know and not question it any more. He woke up fine from the procedure- devoured his apple and scrambled eggs and then decided to lounge around the bed. I kept asking if he was ready to go and he kept replying, "nooooooo". The nurses were great and said we could stay as long as we wanted but after about an hour of this, I was SO ready to go. I stopped asking and started telling. I dressed him and got all of our stuff together- two bags, Thomas blanket, a PECS book that wouldn't fit in a bag, and the Elmo balloon. We went into the hall of the pediatric wing and he threw himself on the floor. The nurse looked at me like what is going on here? She asked if I needed help, ever the stubborn fool that I am said no and held his hand and pulled him out of the wing. About 15 steps down the hall he pried his hand out of mine and purposely ran into the wall. I haven't seen him throw himself into a wall in months & months. He came over and said "Up". I picked him up. I tried to carry him- but with all that stuff and his 38-pound body all bundled up was just too much. I couldn't do it. I put him down, squeezed him, endured a few stares from different people walking by. Thought he calmed down, grabbed his hand and walked some more. He kept screaming, crying, trying to get loose of my grip- luckily at that point we came to a lounge-area. We sat down, him on my lap, sucking his thumb, me trying to soothe him. He was quiet- I talked to him about how I needed him to walk. We made it down the stairs and out the door before the screams began again. At this point I again tried to carry him- made it into the parking garage but told him he NEEDED to walk. Of course we were parked at the opposite end of the garage because when we arrived in the morning I wasn't sure where I needed to be. If I was smart I would've moved the car while he was in the procedure but no room for thinking about "what ifs". By the time we got to the car, I was ready to cry. I wanted to pull my hair out. I wanted to throw the towel in. Brian was still crying, I'm sure feeding off of my energy at this point as well. I buckled him in, I got in the car, and we just sat there for a while. Him sobbing and me just breathing. I got it together, gave him all his favorite things- Tings, Knuffle bear, trains, and some juice. It took him about twenty minutes into the ride home to calm down. I haven't seen a fit of that magnitude in a while. Was it effects from the sedation? Or just a day that had no routines in it too much for him? Who knows? I wish I did. Tomorrow morning Brian is being sedated for an audiological evaluation. I'm scared. I've been through sedation four times with Corbin- with his heart situation as a baby, for his broken arm, and to have a benign cyst removed from his face. He does so well with sedation- comes out of it perfectly. But this is a whole new experience for Brian- and he has two more sedated appointments coming up in the next few months- one for the dentist and one for allergy testing. I have this gut instinct that he is going to have a hard time with sedation- that he is not going to wake up from it as easily as Corbin. So that's been eating away at me especially since I'm going alone tomorrow. I don't know if I'm going to be able to be strong enough to see that fear go through him. Brian and I have a very strong bond and I know he's going to react to strangers taking him somewhere without me there. I'm not looking forward to this....at all. BIG- I mean HUGE- potty news! Brian was sitting on the couch with me this morning watching Corbin & I color pictures when he started repeating "bye bye bye bye". I said "Bye bye? Where are you going silly boy? Are you going bye bye?". He said "Yah" and started running upstairs. I said "Oh do you mean you have to go potty?" (very nonchalantly said) and he said "yah" while still running up the stairs. I tiptoed behind him because I didn't want to interrupt what I was hoping was going to be a completely independent bathroom trip and watched around the corner- him lift the seat, pull down his pajamas, pee, flush, pull pants up and run back downstairs! Yes he forgot to wash his hands lol. This is HUGE! Just huge!! We've been potty-training for over a year and only one other time has he initiated and gone by himself, which was last week. Maybe we are on to something here- please oh please! I'm keeping my fingers crossed & upping the reinforcements for such trips! Bear with me, as I always get so nostalgic around my kiddo's birthdays. I was looking through photos and I found these two of Corbin having a cupcake on his first birthday. His first taste of cake or frosting or even sugar at that point.....and LOVING it! Par-tay (#1) time for Corbin! We had a great family party at my parent's house for Corbin on Thursday night. It consisted of sandwich making, a silly face cake, silly play with cousins, trying to keep a four-year-old quiet about his cousin's present (that he stumbled upon in the office), snacking, & presents which included a new winter coat, Batman Lego PS2 game, and this great "motorcycle"! How have six years gone by so quickly? sometimes it seems like a blur yet at the same time I can look back and I can freeze time and I can remember that first time you stuck your tongue out and you had that twinkle in your eye like you were the funniest baby ever born. I can remember you being taken out of my arms while I cried hysterically for your surgery at six weeks old. I can remember the way you smiled and tried to take your baby brother out of my arms at the hospital when Brian was born. I can remember the first time you did a sign- you were watching a movie and at the end of it you signed "all done" independently and puckered your lips for a kiss while I hugged you so tight for learning a sign. I can remember you hiding in the kitchen cupboards and popping out to try to scare Brian & me. I remember when you got your first bike and you would ride it up and down the driveway. I remember so many things and I want to remember them forever baby boy. You have given me so many great memories and I know so many more are to come. Happy Birthday Corbin! 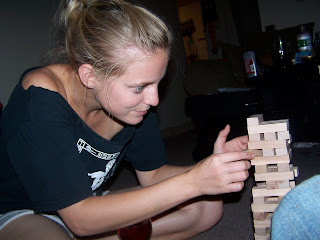 We love game nights- this was the first night we played Jenga! 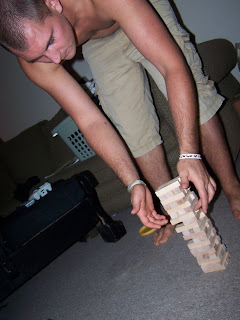 Corbin LOVED it- Brian wasn't really into it- well besides wanting to knock down the tower lol! The tower was quite impressive near the end of the game. I lost, by the way. 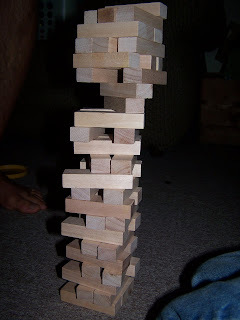 It's no fun being the only female in the house- Corbin & Josh kept scheming on how to leave me the hardest pieces. 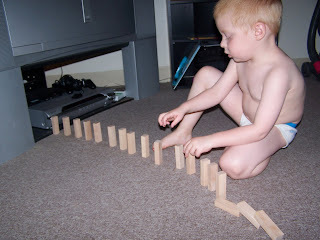 Brian had fun after the official game, setting up the pieces like dominos to see if he could get them to turn on the DVD player. Always thinking, that one. America, we have come so far. We have seen so much. But there is so much more to do. So tonight, let us ask ourselves - if our children should live to see the next century; if my daughters should be so lucky to live as long as Ann Nixon Cooper, what change will they see? What progress will we have made? Barack Obama is the President-elect of the United States of America! John McCain called for all Americans to unite and support Obama as our new president. I can only hope that McCain supporters can be as honorable as he was during his concession speech. We're not Democrats and Republicans, I'm finally proud to say this, we're AMERICANS! Walking home from the bus stop today with one boy on each hand Corbin asked, "Mom, why is Brian so happy?" I looked down at Brian who was giggling and laughing and skipping (a new trick Josh taught him a couple days ago) and tried to find an answer. The first thing I thought to say was, "I think he's happy you are home from school. I told him we were going to the bus stop to get Corbin and guess what, he said- 'Corbin' ". Corbin stopped in his tracks and looked up at me with a surprised look on his face. I looked at Brian and said, "Brian, say 'Corbin'" and Brian stopped and said "uh-bi". Corbin's face lit up and he let go of my hand and went to Brian and wrapped his arms around him and said, "I love you Brian!" It was absolutely one of the sweetest moments, and believe me we have tons of them. I want to remember Corbin's face, when he heard Brian try so hard to say his name, forever. Sometimes I don't know if Corbin really understands Brian, or what Brian has, or why Brian can't talk or why he behaves the way he does. But today I saw that he truly understands emotionally. He loves his baby brother unconditionally and honestly, right now, it's bringing tears to my eyes just writing this. I'm curious as to how many parents of children with ASD have similar digestive and immunity problems as their child? I've always been quite healthy and have kind of prided myself on my immune system as I work in a preschool and tend to be the least sick of everyone in my household. But I do have some digestive problems. And I'm thinking it might be because I'm not following the GFCF diet. When Brian first started the diet we all went on it and I actually felt really good while on it but temptation took over and I started to cheat- a little more, a little more, a little more, until it was a LOT more. When Josh moved in it really went out the window as he wasn't on the diet and I slowly became accustomed to cooking two different meals- well not completely different, but for an example, a pot of rice pasta and a pot of wheat pasta. I feel like this has slowly caught up to me because it wasn't like I noticed it at first, I just am now. I have been having BM problems like two to four times a month (sorry if TMI! )- which I don't find normal and my energy level is just ZILCH- I can NOT get enough sleep! I have always been a morning person and the past six months or so I can not drag myself out of bed- EVERY morning! It's so much easier to implement a diet for someone you want to see change and talk and be happy and fit in with his peers, someone you love more than you love yourself. It's so hard for me to stick to it with all the yummy temptations. "Yes, I am autistic. Stare if you must. I'm not paying attention to you anyway." "I have autism. What's your excuse?" "I have autism and I think you're weird too." "My child has autism. Questions are appreciated, parenting advice is not!" "Is my child's behavior bothering you? Ask me about autism." "What? Is my autism showing?" "Someone with autism makes me proud everyday." "I'm not trying to be naughty. I'm autistic. Please have patience." "Yes, my son is autistic. No, he's not like the Rainman"
"Autism rocks!! And flaps and spins and..."
"I am 1 in 150 very special kid"
"I'm not rude, hyper, or spoiled. I'm autistic." "Not being able to talk is not the same as not having anything to say." "If 1 in 150 American children were being kidnapped we'd have a national emergency. We do. Autism." "Autism. It's not like you think." "If at first you don't succeed, perseverate." "People with autism do not lie, do not judge, do not play mind games. Maybe we can learn something from them." "See the person, not the disorder." Trick or Treat- definitely all treats this year! Trick or Treating was a huge success!! It was the first year Brian was really into it! In past years he'd be done at the first house- he got his candy, he wanted it then & there, and he wasn't doing anymore until he got his way. Not only that but he has never been fully comfortable in his costume, never wanted to walk- always wanted to be carried, and was overall just sketchy about the whole idea of all kinds of kids in costumes being too close to him on the busy streets. Well last night was so different! First of all, he LOVED his costume. The first day we got it he tried it on and was so mad when we had to put it away. He would never wear the headpiece around the house or for Layla's birthday party- but he even did that last night! Wore it all night long! He even kept his glow-stick necklace on- after five attempts of trying to lose it, he just forgot about it. He diligently followed Corbin & Jacob to every house, definitely a little bit slower, but never giving up! He even said Trick or Treat at the houses!! "Tra uh tra"!! He said thank you when prompted, he laughed, and he never once cried when I told him his first choice of candy was something he couldn't have. Corbin, of course, had a blast as well! He was darting in and out of houses- I could barely keep an eye on him- he should of been the Flash instead of Iron Man ;) He kept forgetting to say "Trick or Treat" when he knocked on the door so his tag line became "Thank you and Trick or Treat" as he was leaving their doorsteps. Overall, a very successful Halloween! Oh and delightfully happy to find when we went through candy this morning that Brian made out pretty well- about half of his candy he could keep in his bowl (we had stuff at home that we added to it too!). Definitely a bigger percentage than I thought! Yesterday at Corbin's school he had a Halloween parade. He was so funny as he spotted me and stopped, although everyone else was still walking, to pose and show me his muscles for the camera. What a stud! Brian did REALLY well at it! He didn't protest when he found out the other kids were having cupcakes, helped that we had Skittles. Then he sat through an entire story at the circle with the big kindergarten kids! !